A comprehensive Climate Change Policy is now demand of time, which can cover all climate changes issues including the rights of climate displaced peoples of Bangladesh. I, myself, will take necessary initiative of this requirement as a chairman of Parliamentary standing Committee for Ministry of Environment and Forest. Dr. Hasan Mahmud, MP was said in his speech Round Table Discussion on Climate Displacement issue and Launching of Mapping Study report as a chief guest. 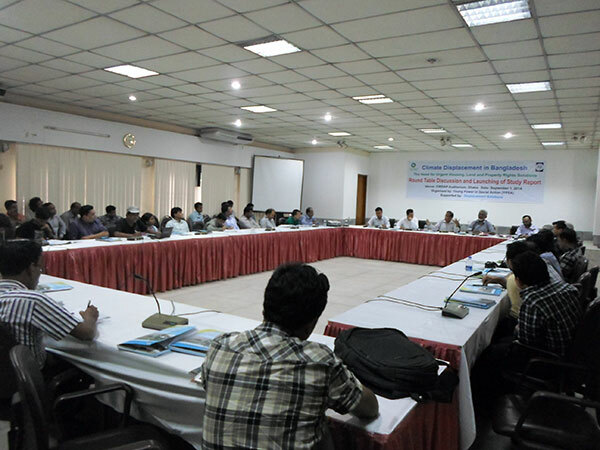 The meeting was organized by Young Power in Social Action (YPSA) at CIRDAP auditorium, Dhaka on 1st September 2014. He also said, state should take responsibility for ensuring basic human needs like food, cloth and housing for the climate displaced peoples. More initiative for research is needed to know the real no. of climate displaced persons as well as monitoring the climate displaced peoples in regular basis, he added. Dr. Niaz Ahmed Khan, Chairman, Department of Development Studies, Dhaka University was present as special guest while Md. Rafiqul Alam, Chief Executive of Dwip Unnayan Sangstha presided over the program. Md. Shamsuddoha, Chief Executive of Centre for Participatory Research and Development (CPRD) moderated the program and Md. Arifur Rahman, Chief Executive of YPSA gave the welcome speech and discussed brief objective of the discussion program. Dr. Niaz Ahmed Khan said that there are no sufficient researches on climate displacement issue. He also emphasized the integration between politician and activism in the climate change field. Mohammad Shahjahan, Team Leader of Bangladesh Housing, Land and Property Rights (HLP) Initiative presented key note paper in the round table discussion. He said, climate displacement in Bangladesh is now major concern in respect of country’s development. To face the challenge of mass displacement as a result of climate Change, Young Power in Social Action (YPSA) has been implementing Bangladesh Housing, Land and Property (HLP) rights initiative with the support of Displacement Solutions (DS) to find out rights-based solutions for climate displaced People since 2012. After the key note presentation, Sujit Chowdhury, Senior Advisor of Climate Change for German Embassy; AKM Sirajul Islam, Paribesh Bachao Andolon; Mihir Kanti Biswas, Bangladesh Paribesh Andolon; Alisan Subrata Baroi, Director of Sushanar Jonno Pracharabhijan; Mizanur Rahman Bijoy, Network on Climate Change of Bangladesh; Aminul Rasul Babul, Executive Director of Unnayan Dhara Trust; Rafiqul Islam Montu, Special Correspondence, BanglaNews24; Gaohar Nayeem, Convenor, Disaster Forum of Bangladesh discussed among other on the key note presentation and gave valuable suggestions for ensuring the rights climate displaced persons. During discussion on key note paper speakers emphasized that Bangladesh requires not only comprehensive policies to ensure the rights of climate displaced persons, but also requires a supporting long term and short term action plan to implement the policies. Distribution of Khas land should the best options but there are some barriers to distribute khas land to displaced people, those are come for other district/upazila. And there are also problem in the identifying process of real landless or displaced people. Speakers express solidarity with the five key actions too. 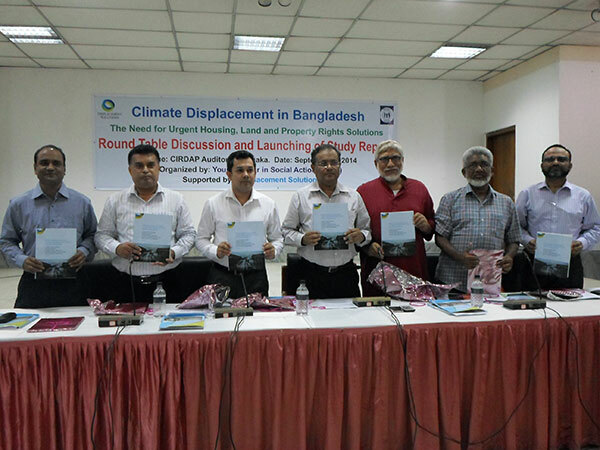 The meeting also launched the Mapping Study Report “Climate Displacement in Bangladesh: Stakeholders, Laws and Policies-Mapping the existing institutional framework”. This 182-page report comprehensively maps and details every law, policy and institution in Bangladesh that relates to the challenge of climate displacement.